Hi everyone. 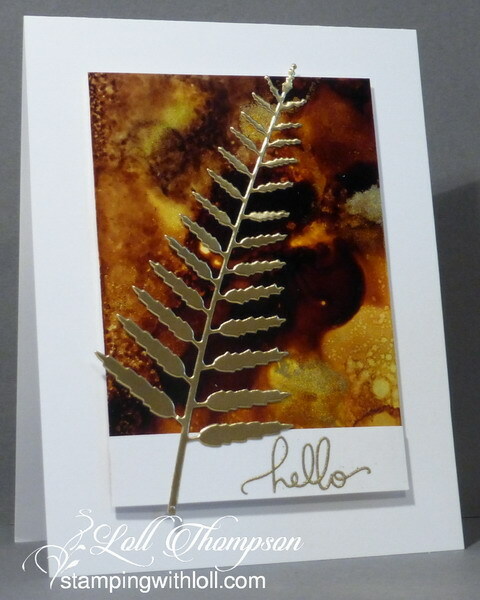 Today I'm sharing several cards I made while filming my latest video tutorial. 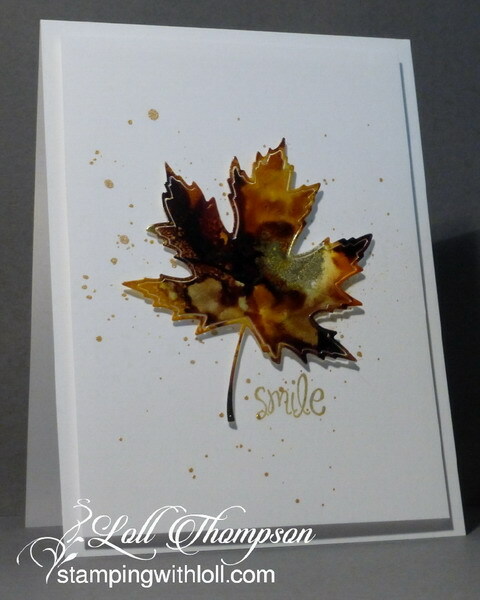 The tutorial is how I work with Alcohol Inks and Yupo Paper. The card above is a small snippet of one of the pieces I made in the video, and below is a card made with the rest of that piece, along with other cards made from samples from the video. I show two different techniques (smooshing and dropping inks), and then show another way to add interest and visual texture. Please check out the video below (on YouTube). If you like what you see, please give me a thumbs up!! Thank you! Notice the texture on the sides of the AI smooshed panel ... made by spraying blending solution once my AI piece was completely dry. Blending solution pushes alcohol inks out of the way to create lighter spots. If the alcohol ink is still wet when you add blending solution, they will flow together and eventually blur. But if the AI piece is completely dry before spraying with blending solution, then the droplets will only push out a little bit until there is too much resistance from the dry inks to go any further. It creates a very unique and artsy design. You can see lots of this visual texture on the cards above and below. Just a quick reminder that my "Twelve Tags of Christmas" event starts on Monday, Nov. 7th. I hope you'll come back to check out my tags for the twelve days, along with the beautiful tags created by my wonderfully talented Guest Designers. And join the fun by adding one of your mixed media Christmas tags! great job on a great video. Well done mf. Thanks for sharing you talents with us. Love, love how your cards turned out! loll, the video is great, and those cards are out of this world. Just spent this morning spritzing with blending solution, off to Michael's to buy more. Gorgeous pieces, Loll! And you've used them beautifully! 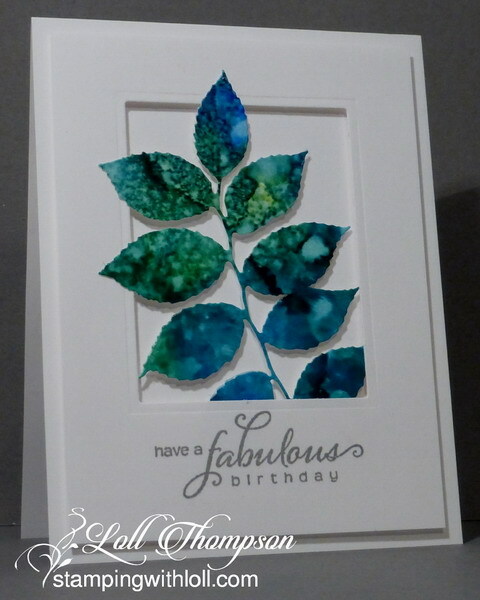 Makes me want to get those alcohol inks out! Love your video! Such beautiful cards! I love them all. And your video is fabulous - a nice short length but containing all the necessary information and great examples. These are magnificent Loll and thanks for the video! It looks SO easy too! When you do a new technique you are so thorough too AND neat! Love the effects of this so it may be time to play again! thanks so much for the video Loll - just ordered some Yupo paper today so looking forward to have lots of fun with my alcohol inks after ages of not using them! Clunk! (that's the sound of my jaw hitting the desk)! Your cards are absolutely gorgeous, Loll! I will definitely order some Yupo paper so I can try this technique...thanks so much for showing us the way! Intriguing to say the least, Loll. 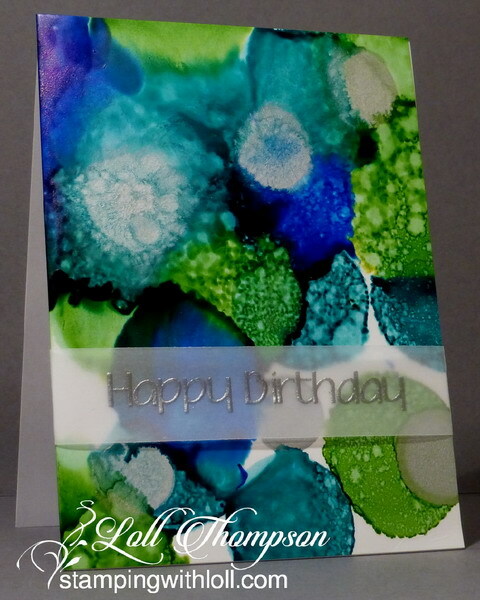 I recently played with yupo paper and alcohol inks and boy, was it fun! Your video really shows that and your cards are absolutely phenomenal! Hope your weekend is full of crafty time! Wow! These are all gorgeous! I REALLY love that brown one. Thank you thank you thank you! I had an order ready to go, then chickened out, thinking, I don't know enough about Yupo and this alcohol ink...but you have convinced me I need these! Gorgeous, Loll!! These cards are taking the "wow" factor to a new level! Thank you so much for the video -- feel like I just took a class in this technique. Oooh .... these are gorgeous. I've been playing with AI's and YUPO this week .... love the effects. Didn't try spritzing though .... but I will now!! Great video too ... thanks for sharing your techniques. Beautiful cards Loll! I just received my Yupo paper and can't wait to get started with this technique. Thank you for the video. oh my golly, this is a parade of gorgeousness. I love the results you are getting with the alcohol inks and Yupo paper Loll. Oh my. These series of cards, though clean and simple, are simply awesome and breath-taking. Thanks so much for the inspiration. Years ago I tried AI - when they were wet, they were beautiful; but when they dried, they were very dull looking. I tried glossy cardstock and regular cardstock. Your results are fantastic - any idea what I could have been doing wrong??? I certainly do like this video, Loll, especially the way you spritz and add droplets with the blending solution. What an awesome technique! Such beauty in those colors, and then the cards!!! Great video's!! Your cards are so beautiful. I love seeing what you create with the backgrounds. You are truly an inspiration!! Love the video, love the cards! just saw your video and it's great, love what you did with the panels! Gorgeous smooching technic will try this method out for sure. TFS. how do I subscribe to this blog? I've done the you tube subscription just need to know how to follow blogs now. X. Your video was excellent...very clear and understandable! As was asked above by AndreaH...how do I subscribe to your blog? Guest Designer at Tag You're It!